The global solar thermal market went into another year of notable decline in 2015. With 37.2 GWth, the newly installed glazed and unglazed collector capacity in the 18 largest countries was 14 % lower than in 2014 (43.4 GWth). Between 2013 and 2014, the decrease in these 18 major countries – which represent 95-97 % of the world market – had been 15 %. The further slowdown last year was the result of diminishing collector area figures in China (-17 %), and in Europe (nine biggest nations down by -5 %). The countries with the highest growth rates last year were Denmark (+55 %), Turkey (+10 %), Israel (+9 %) and Mexico (+8 %). The chart shows both 2015’s newly installed collector area, broken down by collector type – flat plate, vacuum tube and unglazed collector area, and the 2014-2015 growth rate (excluding China, whose 2015 market volume was 21-times larger than Turkey, which ranked second). China added 30.5 GWth in 2015 of which 12.6 % were flat plate collectors (5.5 million m2). The market figures were provided by the national industry associations or individuals. Their names can be found at the end of this article. Last year’s newly added solar thermal collector area is one indicator of the business situation in a particular country. Another one is the long-term average growth rate (Compound Annual Growth Rate, CAGR) between 2010 and 2015, as shown in the figure below. Denmark is the number one in both categories because of its rising demand for solar district heating. The Scandinavian country’s CAGR 2010-2015 adds up to 34 % and there are numerous plans for large-scale projects totalling 500,000 m2 (350 MWth) in 2016. Poland ranks second with a CAGR 2010-2015 of 14 %, but the national statistics include some uncertainty regarding 2015, as the Polish Institute for Renewable Energy (EC BREC IEO) ended its annual market survey last year. The estimate for an additional capacity of 277,000 m2 (194 MWth) in 2015 was provided for the first time by the Association of Manufacturers and Importers of Heating Appliances (Polish acronym: SPIUG), which has a slightly different membership structure to influence the outcome of its annual market survey. SPIUG mainly addresses companies which grew together with the public tender segment over the last two years, the head of SPIUG, Janusz Staroscik explained, whereas EC BREC IEO also covered retail market suppliers, which experienced a sharper downturn. 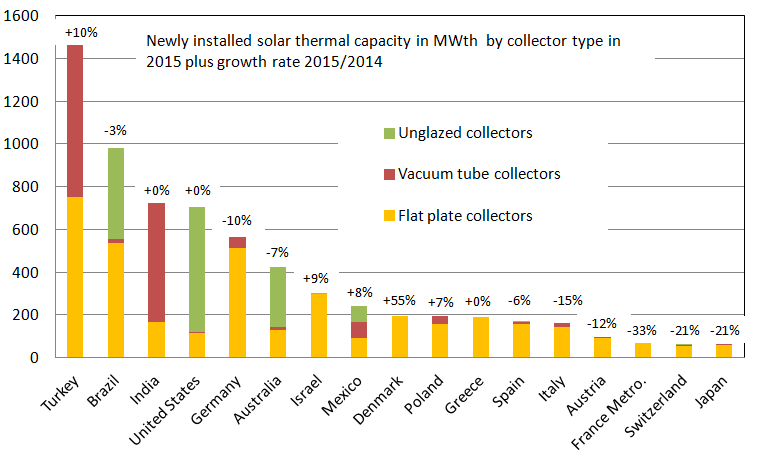 Compound Annual Growth Rate (CAGR) of newly installed collector area of the 18 biggest solar thermal markets worldwide between 2010 and 2015, based on the volume added in 2015. 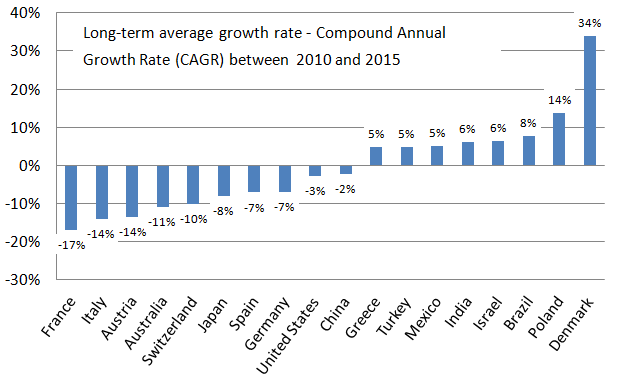 The CAGR rate for India is preliminary. Except for Denmark and Poland, the key European markets displayed rather weak performances last year, resulting in overall negative CAGR 2010-2015 rates, especially across the Mediterranean countries of France (-17 % CAGR) and Italy (-14 % CAGR). Germany wound up with a disappointing slump of 10 % in 2015, bringing the long-term CAGR rate down to -7 %. The low price of oil and gas had a strong effect on the shrinking markets in much of Europe. The German and French market continued with their significant downswing despite the improved benefits to the countries’ national incentive programmes. In Italy, the bureaucratic nature of national subsidy scheme Conto Termico has had the unfortunate consequence of producing only a small number of applications, so that the scheme was merely able to subsidise 10 % of the Italian market in 2014. In Turkey, it was primarily the vacuum tube manufacturers that profited from the increased market volume, which went on to reach 2.1 million m2 (1.5 GWth). According to the statistics by Kutay Ülke, Export Manager of Ezinç Metal, the share of vacuum tube collectors rose to 49 % in 2015, up from 44 % in 2014. Deployment in Brazil last year remained below expectations, with the market down by 3 % compared to 2014, a development not in line with the average growth rate in Brazil of +8 % between 2010 and 2015. Constraints on the market included the national economic crisis, which lowered investment and purchasing power, and the delay in implementing the next phase of the social housing programme Minha Casa Minha Vida. The market statistics in India is only a preliminary estimation assuming a constant market volume in the fiscal year 2015-2016 with a high share of vacuum tube collectors of around 80%. More detailed data will follow in the next weeks. As of early 2016, India’s government and the solar thermal industry were still discussing new support measures to replace the national grant scheme, which was suspended in August 2014 and resulted in a slowdown in demand. A consequence of these discussions was the draft of a Renewable Heating Obligation that, if enacted, would be the first of its kind worldwide. The volume of concentrating collector area was estimated to have been 15,650 m2 in 2015, up from 10,500 m2 in 2014 – but still a niche market.